This book here, produce by one Mr Malcolm Venville, may be just about the best book ever. It takes us into the extraordinary world of the Mexican wrestler and for anyone who was a 70s 'grapple fan' it brings back powerful memories of Saturday afternoons spent waiting for Final Score. 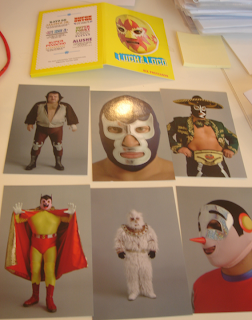 The book is chokka with insane costumed characters, with lots of small grapplers. As Ian Wright once famously said "Those little fellas. Man they just crack me up. They're so ... little."